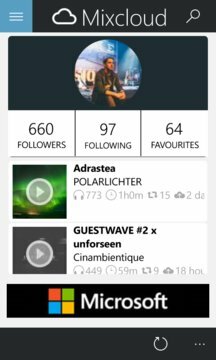 Mixcloud for Windows Phone - first unofficial Windows Phone client for Mixcloud platform. 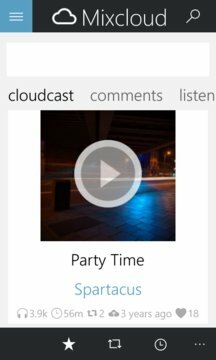 Enables to view cloudcasts, find and follow artists or friends and more. Playing cloudcasts in background is now available!!! - listen to cloducasts in background!!! If you like my app you can now support it by buying AdBlocker in-app product. If you have any suggestions don't hesitate to contact me.